I sure hope so. I don't wish anyone any harm and glad the Mayor is ok, but this is something that I hope happens on a metaphorical level in the next transportation bill. San Francisco Mayor Gavin Newsom's $50,000, high-tech hybrid Chevrolet Tahoe SUV ... was put out of commission Tuesday when a Muni bus sideswiped it. What I mean is that I hope that transit takes over priority from the auto centric bill we have today. Especially SUV's. Isn't Hybrid Tahoe an oxymoron? Randal O'Toole's "Anti-Planner" moniker is also an oxymoron! Regarding the "hybrid Tahoe" -- it is true that this thing is rated at significantly better mileage than a similar conventional SUV, but I wonder how many people will be buying one of these who never really tows or hauls anything? But it's a free country. What's actually more interesting is this -- the "dual mode" hybrid platform that GM is using was jointly developed with Chrysler, and Chrysler was about to launch their own variant. Chrysler's version somehow managed to get even better MPG than GM's, but the entire project appears to be scrapped as they are closing the entire factory which would have made both they new hybrid and the conventional version of the same SUV. At the end of the day, if hybrid technology proves to become the dominant power-train for all classes of vehicles, it's a good thing. If overall we achieve a 20% MPG improvement or more, we're going to have to make gains in all vehicle classes. Why is it that all the hybrid ads I see are for Hybrid SUVs. If I see that stupid Escalade ad one more time that gets 20mpg, I will vomit. If we achieve a 20% gain in MPG, what will almost certainly end up happening, all else being equal, is that VMT will rise by less than 20%. And VMT itself is a problem, a form of what might be called "space pollution", given that space is a scarce resource in urban centers. i saw recently a hummer wrapped in huge signage for a green building contractor, it was powered by biodiesel. biodiesel or not, a hummer and green is the ultimate oxymoron. The hybrid is for showboating. When Newsom went to Montana for his wedding, he had the cops drive the thing from SF all the way to Montana, and back. Not exactly "green" but hey! I'm transitioning my writing over to my other site which was previously called The Direct Transfer. People seemed to be confused by the differences in brand between The Overhead Wire and The Direct Transfer so I made a change and combined the two as The Overhead Wire. 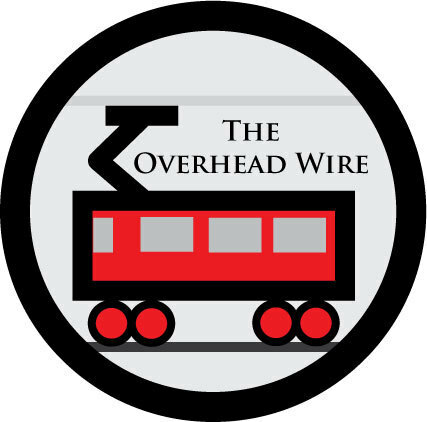 This page will continue to be here and will still be updated sparingly as it has over the last few years, however new original analysis and writing will be featured at TheOverheadWire.com in addition to the news archive and The Overhead Wire Daily email. This blog is the opinion of its author alone and no other entity. This is an open source blog but please give credit if credit is due.